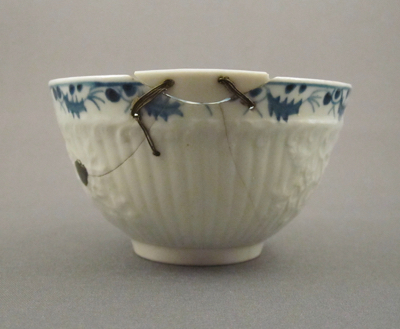 I purchased this unmarked soft-paste teabowl from an antique ceramics dealer in the UK who appreciates early repairs and has provided me with many interesting examples of make-do repairs over the years. 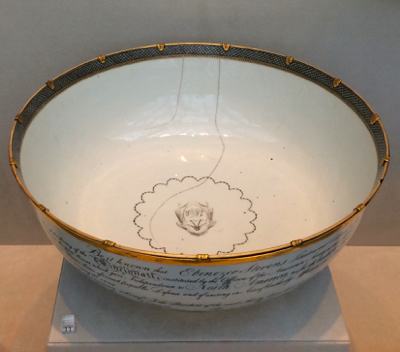 This piece was made by Philip Christian Liverpool Porcelain, c.1765-70, and measures 1-3/4 inches high x 3 inches diameter. 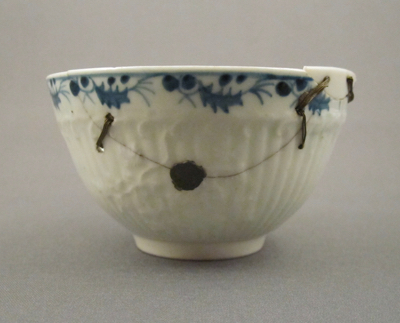 It has a fluted body with molded leaves and flowers, a cobalt blue underglaze border of leaves and berries, and a flower motif painted on the inside. 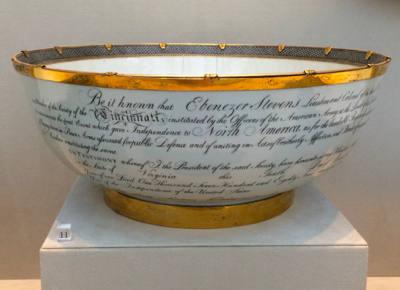 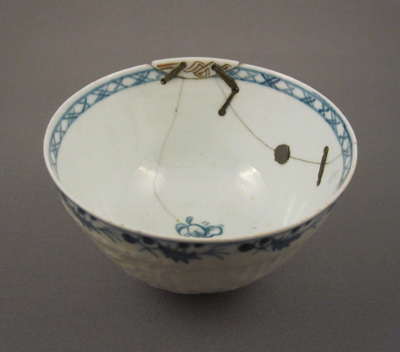 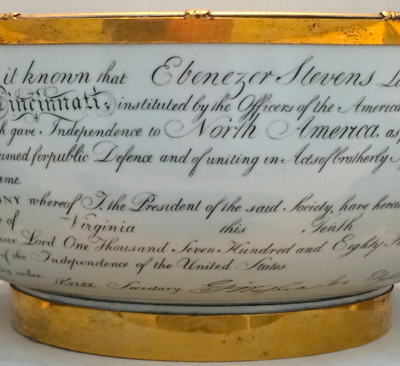 This delicate teabowl boasts multiple repairs done by a 19th century “china mender.” After the bowl broke, a large chip was reattached using tightly bound brass wire wrapped around holes drilled through the body, appearing at first like more commonly used staple repairs. 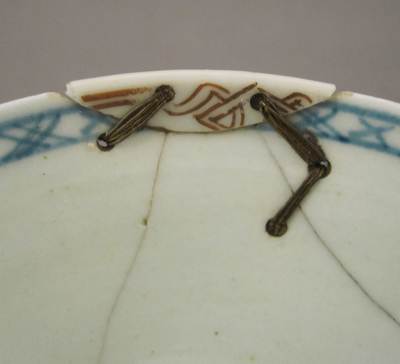 A large blob of lead was applied to the center of the crack, acting as an anchoring rivet. 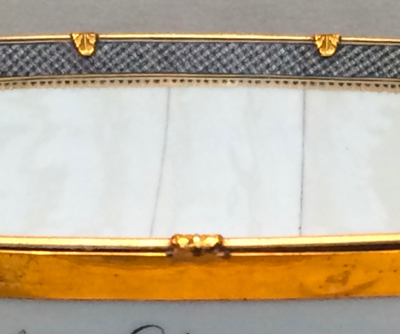 A smaller chip along the rim, perhaps lost or too small to repair, has been replaced with a thin sliver of porcelain decorated with iron-red scrollwork from another piece entirely. 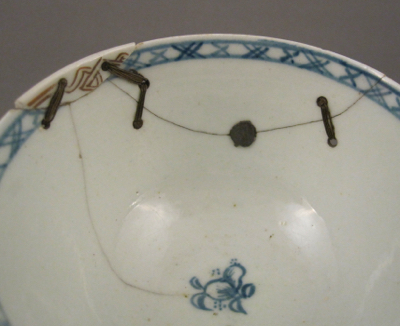 This type of repair, using thin wire instead of metal staples, is typically associated with 19th century repair work done in Belgium and the South of France. 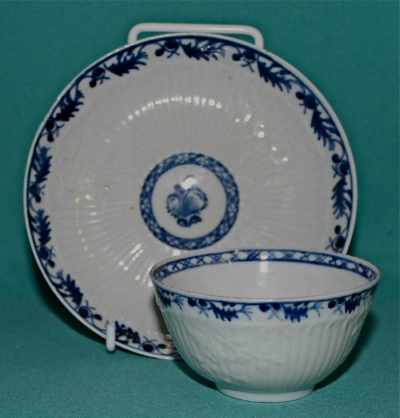 Below is a “perfect” example with matching saucer.